I just wanted to thank everyone for the support and advice that I received here. It took me almost a month to come up with the money to have my home heat treated. During that time, I worked very hard to get rid of all my clutter. I threw away everything that I did not use or actually need. I lost count of the number of bags of clothes I threw away, but it was more than 17! 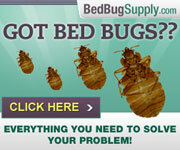 I never ever thought I would say this, but I can see a benefit to having the bedbugs. My house is so clean and uncluttered! I have so much stress just removed for the fact that I walk through my house and feel at home for the first time in my adult life! Who knew how liberating it can be to throw so much away! 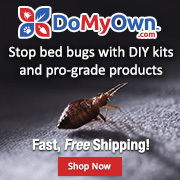 I do not know if many people from my area are on this forum, but if you are in the Kansas, Oklahoma, Colorado region, I highly recommend Midwest Bedbug Services. 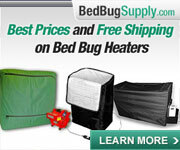 They only treat bedbugs and they do so with heat and blowing the heat through a huge tube. 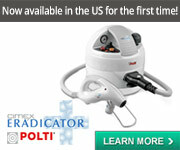 When I entered my house six hours after the end of the treatment, my plates and tools were still hot to the touch!! I am so excited!! The past two days are my first in this house without bites since March! I have learned so much from reading and posting here. Thank you again for helping me through one of the most difficult times in my life. My ex took the children until my home could be safe. He is waiting a few more weeks. I am so eager to get my life back and have my children home, safe from bugs again!! I wouldn't be where I am right now (and in a good mental state) had I not discovered this forum. I found myself saying this exact same thing about a week ago! The situation as a whole is not so great, but when you look closely, there are some silver linings!!! Congrats to you on a job well done and fingers crossed for a bugless future!! I am, by no means, a pro. I'm simply a person that has had unfortunate luck, and somehow acquired the little guys. Any/all 'advice' I have to share is based on my own personal history and/or things I've read from the professionals on this site. My profession is medical, which is where I am confident in any advice I give, however rare it may be. Awesome I'm happy for you. And I agree getting bed bugs had it's plusses my home is now clutter free and has never been this clean I have four children. I had my heat treatment over a week ago have not seen one bug or any new bites other than one on my daughter's back but we live near woods and they play outside a lot. I'm still not sleeping the best and I can't get over the feeling of bugs crawling on me. They come back the 12th to make sure I'm clear. My pest company is coming back next week to just check things over. I have a 90 day guarantee. I have learned so much, I hope enough to avoid this in the future. I love finding the silver linings in life. 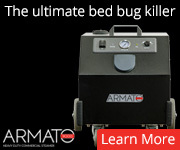 Two weeks ago, I just could not imagine there could be one with bedbugs! I slept very well last night, but when I am awake, I still double look thinking I saw something crawling. I still itch, but I was told that can last two weeks after being bitten. I think I may always itch...it is probably psychological at this point. I do not itch in my sleep...so that is a very good outcome! I am glad you both have success, too! I am smiling so very much yesterday and today! I think I am happier now than I was prior to bedbugs. They can really change a person's out look on life! Life is good!! Just be careful about your kids belongings when they come back home. If your house was infested when they left with their luggage they could have brought them with them. If thats the case your ex might want to have their house checked too. If they have the same luggage they left with, throw it out and dry all their clothes, dirty or clean, on high for an hour. Do this before washing them. Any books or toys that cant be submeged in hot soapy water sealed up in ziplocks for 1 year. Unless you can get nuvan strips. Then you just follow the directions on the box. "My ex took the children until my home could be safe. He is waiting a few more weeks. I am so eager to get my life back and have my children home, safe from bugs again!! I wouldn't be where I am right now (and in a good mental state) had I not discovered this forum." 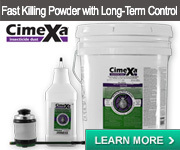 Please keep in mind that the infestation could have been brought to your ex's home. Hopefully they weren't from his home to start with. Your children are the mode of transportation. My children did not take anything with them except the clothes on them which had been dried for 40 minutes. Tbey showered, put the dried clothes on and walked out the door. However, prior to detection, they had been going back and forth lugging all their favorite belongings. My pest company has dogs in training. Since they are just in training, he has offered to check both homes next week for free. My ex and I are both aware that this may not be accurate. However, the company looks for the bugs if the dogs alert. Therefore, we feel it is at least worth the time. Basically, if they do not find anything, he and I still plan to behave as though we still have them. If a bug is found, then my home will be retreated for free, but my ex would then need to treat his home. I appreciate all the advice here. My ex and I both felt we may have gone overboard in trying to prevent spreading them back and forth. After reading these last two comments, I now know we are doing the right thing in restricting the items that can go back and forth, once the children do return. 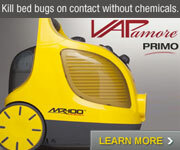 Hi, are you still bed bug free? Thank you for posting this success story. Your attitude is inspiring and I hope the pests never returned. We had a whole house heat treatment a week ago today after having two pesticide treatments and still seeing one live bed bug. Even though it was moving slowly, I was annoyed enough to schedule the heat treatment for two days later. It was $2,800, but we have an older, large home. A chemical treatment also was sprayed around the perimeter. Who knows what is hiding under the wooden floor boards and behind those walls?! I saw a total of one live bed bug since this whole thing started when we found out that someone visited us whose rash turned out to be bed bug bites. She is a college student and was mortified, but we took action immediately and I am glad we got a professional in. The only staining the inspector could find was a small little spot under the boxspring of our adjustable Tempurpedic. I am not sure how these bugs travelled from her to me and then to the master bedroom after she left but they did. 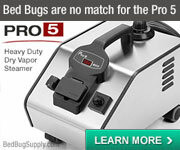 Five dead bugs were found after the heat treatment -- and I just vacuumed up another dead one today. The pest control technician said he heated the house to between 135 and 145. The treatment took 10 hours. Someone on this site should market a 60-day count down calendar!